The hard fork came, went, and now we are much better for it. Depending on who you ask, Bitcoin Cash is a roaring success or failure. Traders are neutral beings only concerned with generating profit. The fear, greed, and widely different policies enacted by exchanges offered juicy arbitrage opportunities. Bitcoin Cash was not the first altcoin to enter existence through a hard fork of Bitcoin. However, it was the first to be widely publicised. Even the New York Times wrote decent articles explaining what Bitcoin Cash was, and what it could mean for Bitcoin. Even though SegWit is activated, the scaling debate is not finished. Later this fall, it is extremely likely that Bitcoin will hard fork again. A version of Bitcoin with SegWit and a 2MB block size (SegWit2x) will begin trading. Therefore, traders should learn about how to make money using derivatives before, during, and after a hard fork. I will use the example of Bitcoin (XBT) and Bitcoin Cash (BCH) in this theoretical example. A hard fork of any digital currency is akin to a stock dividend. There is a finite amount of network hash power at any time. Miners will decide which version of a coin to mine based on the price ratio. The difficulty will then adjust to bring the ratio of hash power and price into equilibrium. Price leads difficulty adjustments. 1 August 13:17 UTC was the record date for BCH distribution. If you held XBT on that date, you theoretically were entitled to BCH in a 1:1 ratio. If you purchased Bitcoin after the record date, you did not receive BCH. After the record date, a stock goes ex-dividend. The stock price will drop by the dividend that is paid. If we believe that hard forks act like dividends, then XBT went ex-div on August 1st. XBT should have dropped by the value of BCH. In practice, because price leads difficulty adjustment, it isn’t necessarily true that XBT will or should drop immediately by the value of BCH. Additionally, unlike stock dividends which are a discrete amount of cash, BCH is a tradable currency and its value fluctuates. Holders of long futures contract do not receive dividends. Therefore a futures contract should trade at a discount relative to the expected dividend payment. If it doesn’t, arbitrageurs will buy a stock and sell the future. They will receive the dividend payment from their long stock position, and if that is greater than the futures discount, they make money. The same phenomenon should occur in the Bitcoin futures markets. BitMEX decided that our XBTUSD and XBTU17 products underlying index would not include the value of BCH. Traders who wished to create BCH without any XBT price risk bought XBT, then sold the USD equivalent number of swap or futures contracts, and then receive BCH. Note, they would not receive any BCH for XBT margin held on BitMEX. XBTUSD and XBTU17 theoretically should trade at a discount relative to the value the market places on BCH. The big difference with BCH is that the future price is unknown. The above chart is the outright % discount of XBTU17 from July 30th to August 3rd. The chart illustrates that traders attempting to create BCH without market risk drove the futures into extreme backwardation. The discount reached almost 5% hours before the record date. The above chart is the outright % premium or discount of XBTUSD during the same time period. Traders also sold XBTUSD to create BCH. The swap was backwardated, which resulted in shorts paying longs funding. Over this time period shorts paid 3.51% of funding. Remarkably the swap reached an outright 3.52% discount hours before the record date. The following trades assume you have no view on the viability of BCH. BCH may or may not be successful, but the trades I will describe yielded predictable positive returns. The trades described also have no Bitcoin / USD price risk. Predictably interest rates to borrow Bitcoin spiked during this period. Borrowing Bitcoin during the eye of the storm is not advisable. Prudent traders should have credit lines in place well in advance of the event. That allows them to lock in much cheaper rates. Using the above chart as a guide, putting this trade on hours before the fork yields the best returns. That is when traders are the most irrational. The best part is that the basis will mean revert quickly, and it did, after the fork. Therefore you limit the amount of time you pay to borrow Bitcoin. Assume you paid an egregious 1% per day to borrow Bitcoin. XBTU17’s discount went from 5% to 1% in 24 hours. Therefore, you could have earned 3% in one day on this trade. Again the best time to put this trade on is hours before the fork. The beauty of funding is that for the rate to go from negative to positive, the swap must go from trading at a discount to a premium. Therefore you get paid twice. You capture the full discount, plus when you exit, the swap will be at a premium. While the swap basis mean reverts, you also get paid interest every 8 hours for being short. Once the published rate is positive, you close you long at a premium. After August 1st, it took a subsequent ten funding periods before the rate was positive again. The fork is over. The community breathes a sigh of relieve and hedges must be unwound. 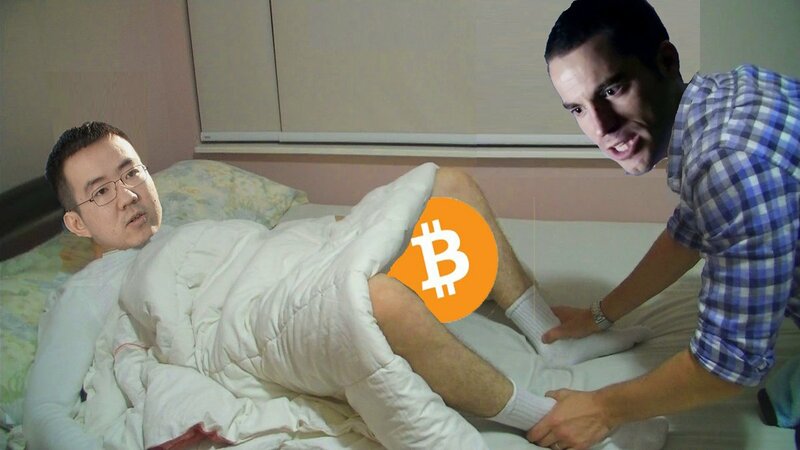 Any trader that created their BCH now has it, and must close short derivative positions. The problem is that if Bitcoin rallies alongside the unwind, basis will rise, and hedgers will be forced to cover at much higher premiums. A priori we know the short squeeze will be violent. Therefore it is prudent to go long basis after the record date. 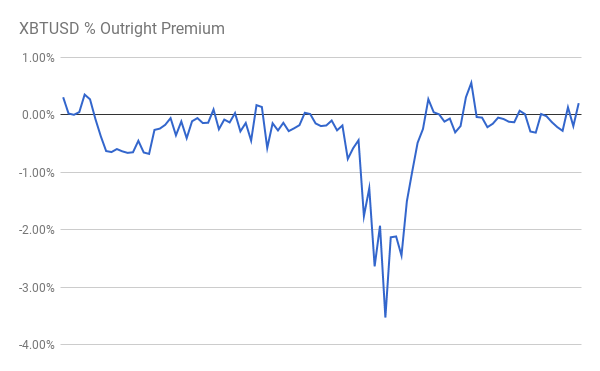 The above chart is the XBTU17 outright % premium from August 3rd to 8th. 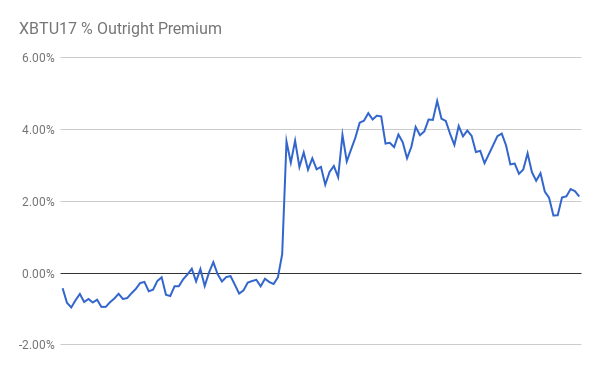 The massive jump in premium occurred as the price broke $3,000. Remarkably traders were given an opportunity for days following the fork to buy XBTU17 at a discount. Those that did are test driving Lambos while you ride the bus. 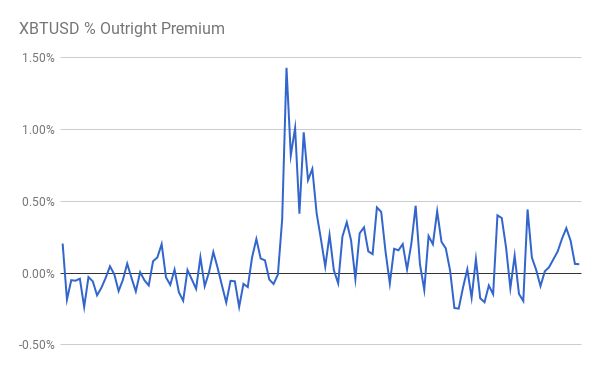 The above chart is the XBTUSD outright % premium over the same time period. 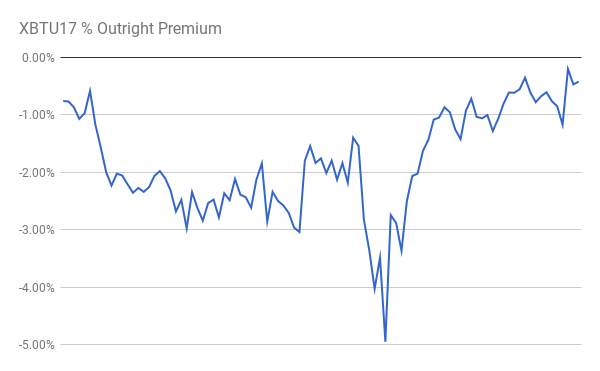 The spike in premium occurred as the price broke $3,000. During that same time period, the funding went from negative to positive. In total, shorts received 1.76% of funding. The aim of this trade is to play the mean reversion of XBTU17 basis. Hedgers on the margin will choose to short the future to create BCH because the interest rate they pay via the discount pre-fork is fixed. As opposed to XBTUSD which has a variable interest rate, and cannot be known a priori. Therefore XBTU17 basis will go from negative to positive. As the XBTU17 basis mean reverts, XBTUSD’s funding will shift from negative to positive. You benefit from a rising XBTU17 basis, plus your short XBTUSD hedge also receives interest income every 8 hours. Booyakasha! Bitcoin Cash was a warm up for the main event later this year. Both the big blockers and SegWit disciples believe their cause was vindicated by the recent hard fork. Big blockers point to the non-zero value of BCH as proof the market values their scaling solution. SegWit folks point to the high and rising price of Bitcoin as proof that the market values their scaling solution. Neither side will back down before the SegWit2x hard fork put forward in the New York Agreement. The Fear Uncertainty and Doubt (FUD) surrounding the SegWit2x hard fork will be deafening. This FUD will put a lid on the Bitcoin price. $5,000 will not be broken until after the hard fork occurs. This sets up an exact replica of the Bitcoin Cash hard fork with more money on the line. The trades and scenarios described above will remain relevant in a few months time.